Serzany scarf knitting pattern available! İt's finally ready!!! Serzany scarf knitting pattern is now available. Serzany is a beautiful lacy scarf which features a lovely and deep textured stitch pattern too. 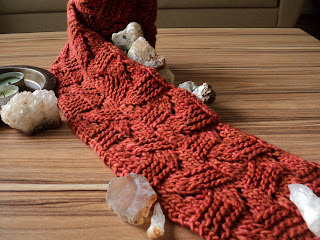 İt is a quick and easy scarf to knit and it is a knitting pattern for beginner. İ used Malabrigo merino worsted for this project. İ love the softness of this yarn. İt shows so beautifully the beauty of the textured stitch pattern. Although the stitch pattern seems quite complicated, it is actually very easy: it only requires knit, purl, ssk, k2tog and yarn over stitches. İ used only one skein of Malabrigo merino worsted. The chart included in the written instructions from pattern makes so easy getting a wider or longer scarf. Don't forget that making a wider or longer version of this scarf requires more yarn. Finished size: 55½ in / 140 cm long and 5 in / 12 cm wide. Yarn: Malabrigo Yarn Merino Worsted (100% wool, 100 gr/skein, 210 yards/192 meters, color Red Java 79), 1 skein. Needles: US8 /5.00 mm needle or size to obtain the gauge. Gauge is not important for this project. Gauge: 18 sts x 23 rows = 4 in / 10 cm in St stitch. Gauge is not important for this project. You can buy this pattern through Paypal (no account required). Credit card holders: You don't need a paypal account. Click the Buy Now button and it will give you the option to pay with credit card without signing up for a Paypal account. Do not resale the pattern. You can sale items made using the instructions from this pattern. It's beautiful. I really like the colour too. Looking forward to seeing a photo of the skirt you've just made. The scarf looks nice; thanks for sharing. I love this scarf but fear it may be above my abilities. What skill level would you say it is?